Math--it's what's for dinner! Sort of. 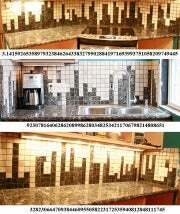 At least you can serve up some tasty dishes--and make your kitchen a hit with all of your DIY- and math-geek friends--with this custom pi tile backsplash. As an added bonus, it will provide you with the opportunity to make endless pi/pie puns and jokes. It's also relatively simple to do, if you follow the online tutorial. To achieve this, you'll need 2-inch-by-2-inch square tiles, so this won't exactly be rocket science (no, it'll be pi! Yuk yuk). Basically, get tiles in two colors so that you can create a contrast or checkerboard design, then begin to arrange them as though they were pixels or Tetris squares or digits of pi to create a design. Next, measure your backsplash area (length and height) so you can calculate how many tiles you'll need. Measure and plot out where everything will be going on the wall, and mark where necessary. Lay out your tools, mix some tile adhesive and get to carefully setting in your tiles. Let dry for 24 hours and then wash. It's worth reading the entire tutorial because it contains many helpful hints concerning things like tile spacers and electrical outlets, as well as for its many instructional photos. The tutorial points out that another good idea is to design the tiles in a music equalizer pattern; but there are dozens more great (and geeky) possibilities. What better way to pay tribute to the ways that math influences our lives?